My neighbor mixed mauve and orange colored California poppies in his garden this year. His garden is to photogenic. You all will be seeing more poppy shots :). Thanks for stopping by. I love their colors. Beautiful close up capture. Gorgeous mix of colours!! I love poppies and am sad that for some reason none of mine have come back this year!! Fav!! A beautiful shot and lovely colours, fav! What a generous 'gardener neighbour'! What lovely flowers they are. Great title -- they do seem very festive. Indeed colourful... but I do hope that's an ornamental thistle on the right! Oh la la! 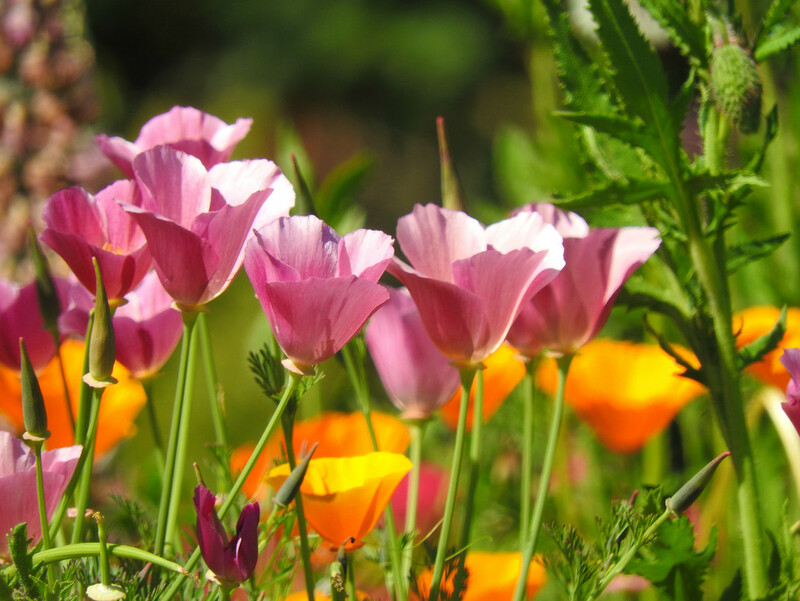 Beautiful poppies and colors! Fav. It makes me want to go to their party. Beautiful colors! I love the lighting and your colors. So many different coloured poppies. VML the 'opposing' colours. Chapeau!